As always, this is about wine, but it takes a while to get there: Be patient. When I was a kid, I couldn’t wait for summer and the beach. Now that I’m older (we will pass over silence exactly how old), I find I can happily do without the sunburn and the jellyfish and the sand in my crotch, a less-than-nirvana attained only after hours of creeping through endless strings of traffic. What I miss most isn’t the sea but the seafood. But hey! I live in Manhattan, which is an island, right? And it has access to Long Island beaches and the Jersey shore, yes? And they still deliver fish and stuff, if not to the Fulton Fish Market, at least to somewhere close by, from which it gets to Manhattan restaurants, doesn’t it? And one of them is the Oyster Bar in Grand Central Station, which is easily reachable from almost anywhere, right? Absolutely right. The aptly-named Oyster Bar is molluscophile heaven, home to more varieties of my favorite bivalve than any stretch of seashore in the world. My all-time favorite lunch consists of perching at the counter there and slurping down some fine, briny northern oysters – I love Tatamagouche or other Nova Scotia or Prince Edward Island kinds: the colder the water, the tastier the oyster, I think – and following that with an oyster po’boy. The Oyster Bar makes the best example of that New Orleans specialty sandwich that I’ve had north of The Acme Oyster House on Iberville Street. All this marine delight is accompanied, of course, by a glass or two from the Oyster Bar’s lengthy wine list. This present ode to the oyster and its vinous companions was inspired not by re-reading Lewis Carroll (though the walrus and the carpenter are never far from mind), but by a delightfully civilized morning that the fair Diane, wife and webmistress, and I recently spent suppressing the discomforts of Manhattan’s baking July weather. We began in the comfortably air-conditioned Morgan Library and Museum, ambling through a battery of impressive exhibitions, from Sumerian cylinder seals in the basement through Durer drawings and prints and two galleries of Romantic garden designs and prints on the first floor, to finish with an exhibition of Palladio’s books, designs, and models on the second. By then it was almost lunchtime, so we strolled – staying in whatever shade was available and marveling that some midtowners still wore suits and ties – up to Grand Central, that wonderfully cavernous city within the city, and down its long inclined plane to the tiled and equally cavernous refuge of the Oyster Bar. We picked a good day, when the catch was abundant: 37 varieties of oysters to choose from, and 116 white wines to accompany them. O joy and ditheration! My favorite Tatamagouches were there, as were Bras d’Or and Lady Chatterly (! 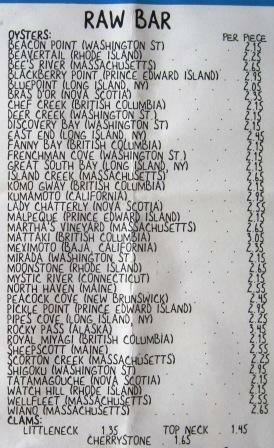 ), also from Nova Scotia, as well as Blackberry Points, Malpeques, and Pickle Points from PEI. 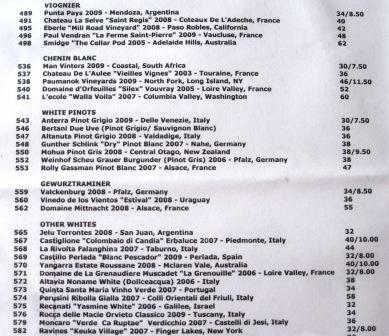 Difficult as it was to choose among those, the wine list presented more quandaries. We could ignore sparkling wines, which neither of us was in the mood for, and – while I like a good, unoaked Long Island Chardonnay when I can find one – the generous selection of Chardonnays was not strong in that category: too much in-your-face style Pacific Chardonnay, too little interesting Chablis. Sauvignon suffered similar problems. And we had been drinking a lot of Riesling and Muscadet at home lately, so we wanted something different. It came down to a choice between a nice Touraine Chenin Blanc, an Ardèche Viognier, or a Friuli Ribolla Gialla. Any of them would match nicely with almost any seafood: we finally opted for the Viognier, for its extra bit of spice. It turned out to be a good choice, because after we devoured our oysters we decided to go for plates rather than po’boys: fried clams for Diane, fried scallops for me (split half and half, of course). Both were terrific, the scallops especially as fresh and sweet as I have ever had (If you don’t challenge the kitchen but stick with the simple stuff, you can eat very, very well at the Oyster Bar), and the Viognier approved of both. A very contented couple toddled to the subway for the easy trip home. So who needs the Hamptons, or the Jersey Shore? If you can get to Grand Central, you can get the best of either, without the hassle of either the Long Island Expressway or the Garden State Parkway. Postscript: The Oyster Bar has a red wine list almost as long as its white. While I’ve never yet been moved to sample any of those, it does lead to several thoughts. One: This seems preposterously disproportionate for a restaurant that offers exactly three non-fish items: a steak, a chicken, and a vegetable platter. Two: this list, like the white list, leans heavily to New World/Pacific Rim wines, and like the white wine list seems hardly to have heard of Italy. I may be partial – in fact, I am partial – but nevertheless this seems to me to be a situation that needs redressing.